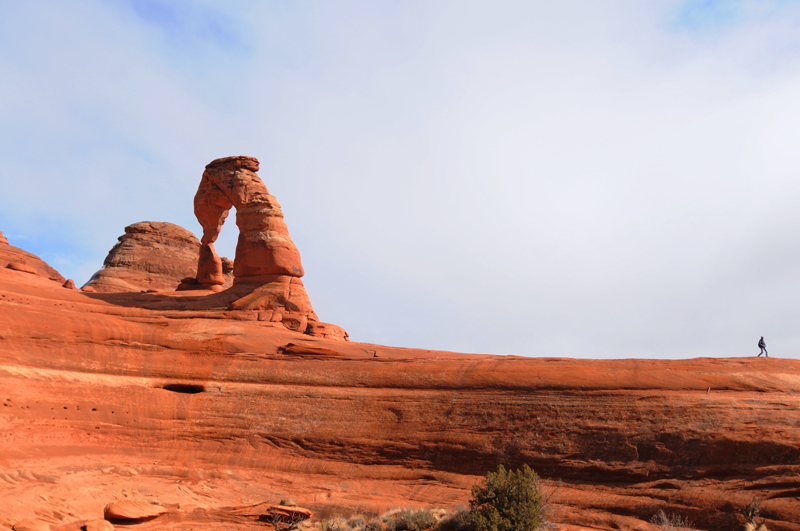 This is the famous Delicate Arch. That little dot on the far right of the photo is me. Known internationally to photographers as a sunset destination, we hiked out to it on a rainy afternoon thinking we might capture some interesting cloud formations. On our way out, the rain stopped and the blue sky peeked through some of the clouds. We almost had the place to ourselves! Another spectacular sunset. 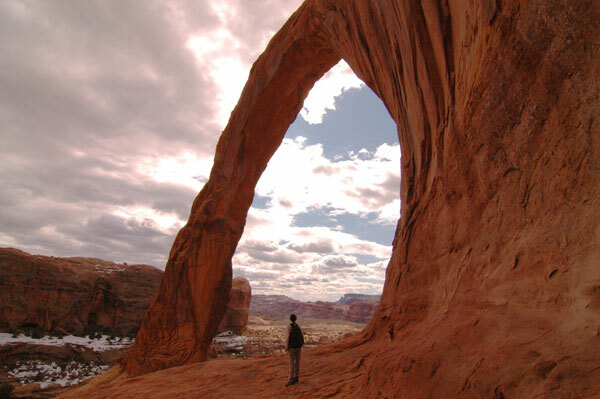 This is Skyline Arch in Arches National Park. One bonus to traveling during the winter! Did I mention that the colors of the dirt and rock around here are crazy?! 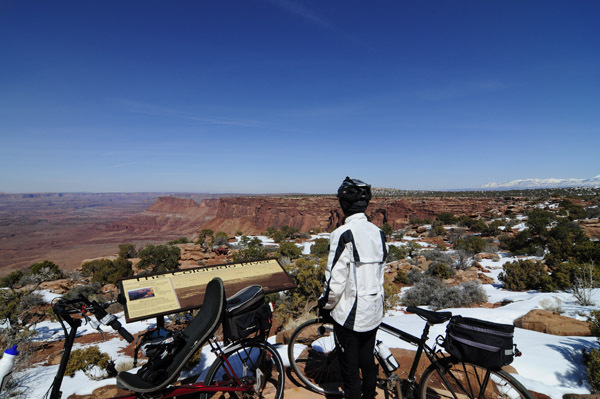 We rode our bike to the Needles Overlook in the portion of Canyonlands National Park south of Moab. It was a great ride even though a lot of the road was covered with snow. We saw more bikers than cars on this 32 mile ride. Yeah! The stories told by the gnarled, weathered old tree trunks are almost as interesting as those of the land. My niece, nephew, and brother-in-law came out to visit us for a couple of days. It was so great to see them. 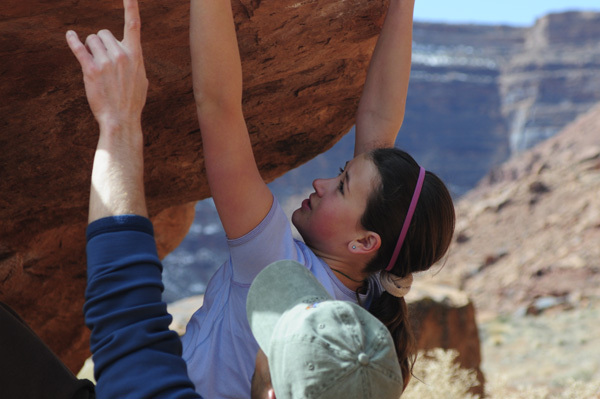 They showed me a thing or two about bouldering. My 30 seconds on the rock had me wincing in pain for the next week! On this particular bike ride Mitch was going so fast that his mustache blew right off his face! 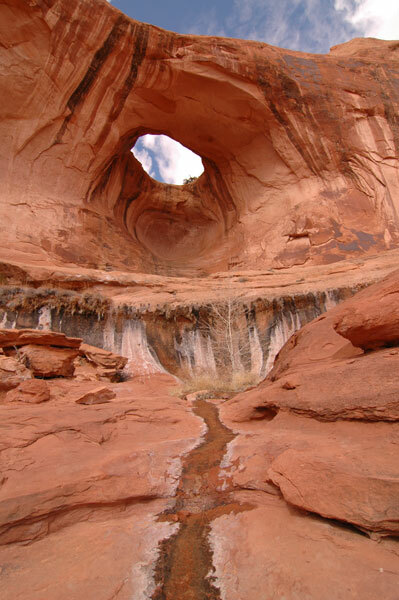 Wind and water are the insane artists that created the unique canvas of the Moab region. In our previous travels here we had experienced the wind part of the duo. One time a camper in the same RV park as us was blown sideways on its jack stands and four telephone-pole-sized poles supporting a billboard were snapped in half like toothpicks. We’ve been on bike rides here where we had to dodge tumbleweeds flying at us from all directions and even passing us like we weren’t moving. The grit in these wind blasts becomes part of you – it’s in your hair, eyes, teeth, and water bottle. 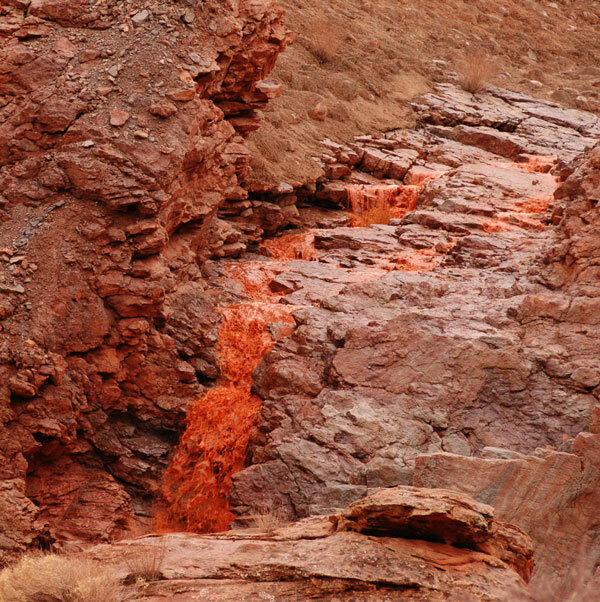 Although this looks like molten lava it is just the color of the water after traveling over all of the red sandstone. And although we’d heard stories of waterfalls cascading off of every cliff face and seen the evidence of violent and not-so-violent water events, we’d never actually seen it rain here – until this year. And now it won’t stop! 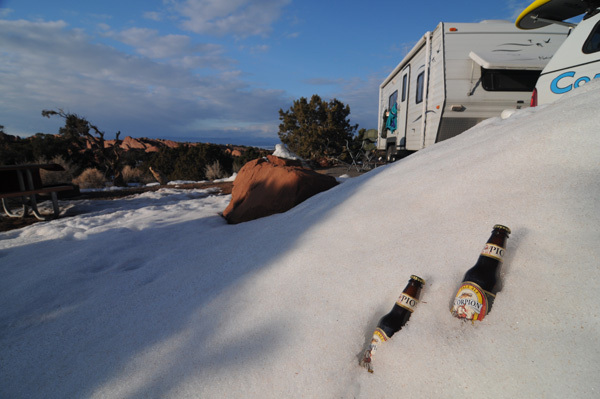 Like the rest of the country, Moab has had a bizarre winter. Locals say they’ve been covered in snow since November and have had more snow than even the old-timers can remember. The combination of the snowmelt and the hit-or-miss downpours has made many of the trails here very messy. Biking through wet clay is like riding through crunchy peanut butter. We made that mistake once and will always try to avoid it now! Road biking is still good, just a little cold and damp. And the upside is that now we have seen what a little bit of water can do when it lands on a huge hunk of rock! 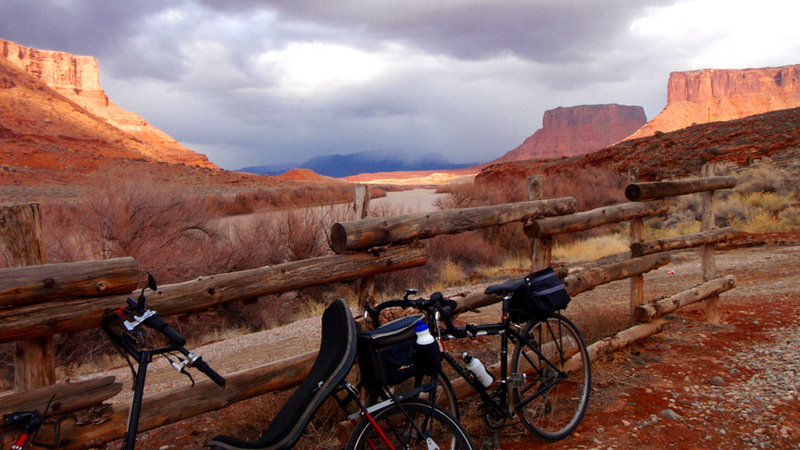 We rode our bikes along the Colorado River to a hotel, restaurant, winery called Red Cliffs Lodge. Even though the clouds threatened and somewhere up valley was getting wet, we stayed dry. The damp weather in Moab has made for some conditions we have never seen here before such as fog. 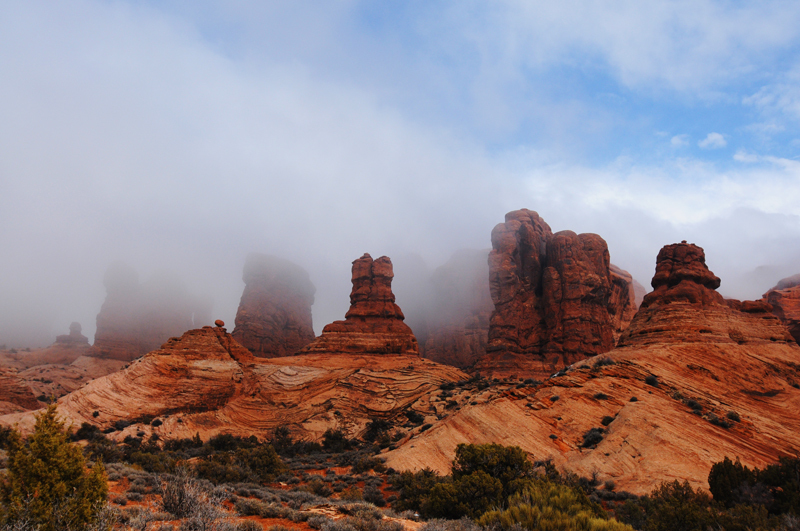 It was surreal to see the clouds and mist infiltrating the spires and arches of Arches National Park. I am standing beneath Corona Arch appreciating the incredible view. Ahhh!! We’re back in Moab. My wish for everyone is that they have at least one place that makes them breath a sign of relief every time they return to it. 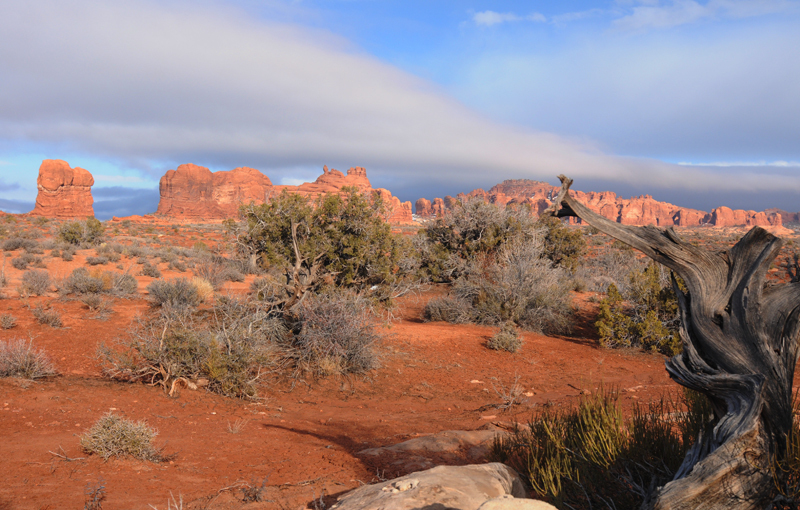 We are lucky to have a few locations that just seem to click internally and Moab is definitely one of them. We left San Francisco the day after Mitch’s symposium. The thing about towing your home behind you is that you have to be vigilant about weather and road conditions ahead of you. We had to get across the Sierra Nevadas and, although we have enough chains for both our truck and our trailer, we prefer not to have to use them. So we had to get out before the storms started rolling in. 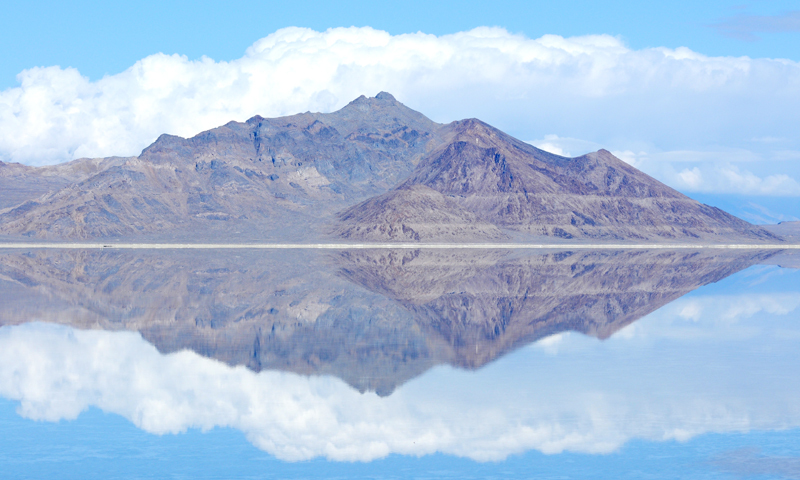 Somewhere beyond this glassy lake is the famous Bonneville Salt Flats. The historical marker stated that the fastest land speed recorded there so far (the sign was from the 70’s) was 622 mph. Many people dread the drive on I-80 across Nevada and Utah but I think it is fascinating. It is as if, without the watchful eyes of all of the millions of people in California, the earth and sky are finally free to do whatever crazy thing they feel like doing. Clouds reach to the ground and set off dust devils with every patch of sunshine. Barren mountains jut up a couple of thousand feet and then disappear abruptly into the flattest, sagebrush covered ground you can imagine. Water becomes salt and salt becomes water indistinguishably. One day when we have our 4wd self-contained, heavy duty RV we will return to this area and explore it thoroughly. 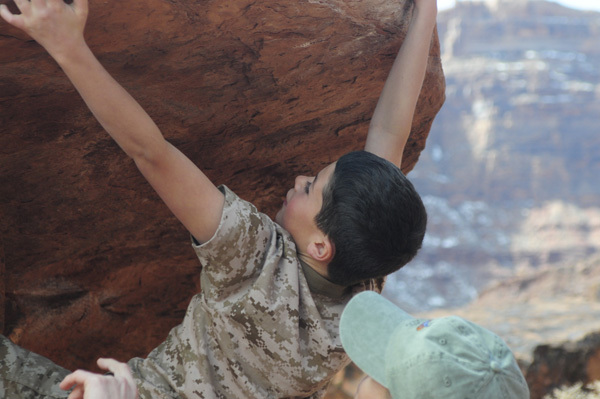 Moab is Mecca for outdoor enthusiasts. Almost anything you could ever think of doing to raise your heart rate is possible here. It is best known for mountain biking. We didn’t bring our clunky, old mountain bikes with us so we’ll get to rent the new models with all the bells and whistles. I have no doubt that it will be overkill for my abilities but it will be fun anyway! 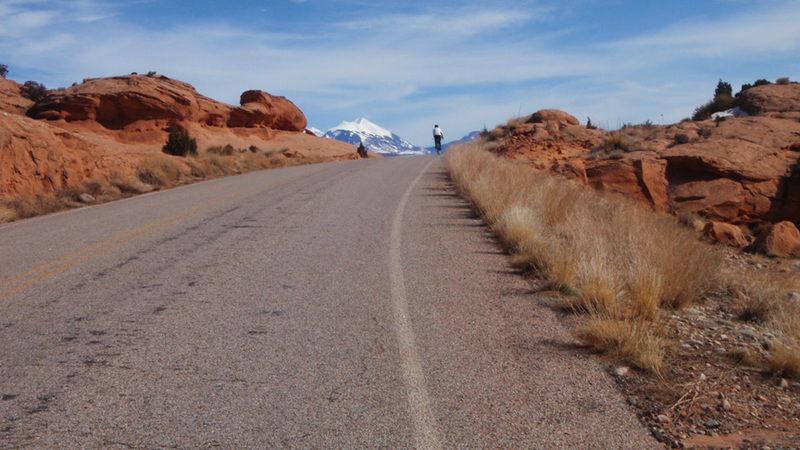 Road biking is great in Moab, as well. 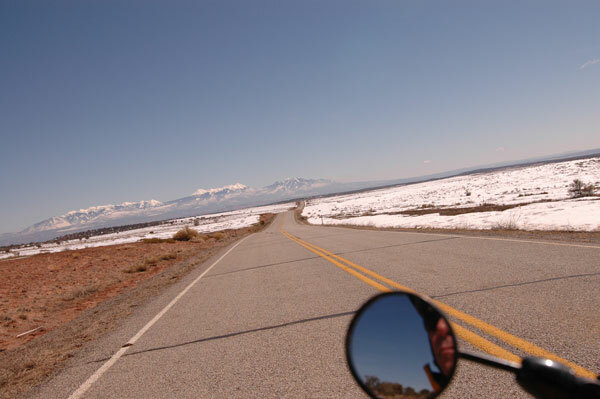 The La Sal Mountains are the snow-capped peaks in the background of this photo. 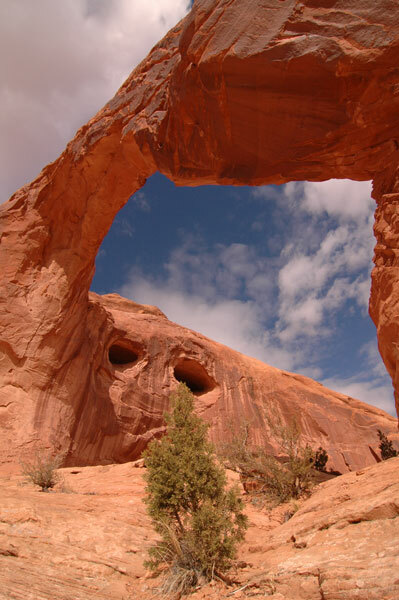 This is another view of Corona Arch with a funky rock formation in the wall behind it. Yet another arch on the trail to Corona Arch. At the base of this arch was a solution hole which drained to another solution hole. The plants here are amazing opportunists. A small aspen tree was growing in the base of the hole with just a hint of soil and even less moisture.